The grand old ghouls of death metal, Morbid Angel have a tough task to keep themselves from falling into the dreaded "influential but over the hill" slot. Newer bands like Nile, Cryptopsy and Misery Index are providing ferocious competition and a strong challenge to make Morbid Angel irrelevant. So each new Morbid record has to pick up the gauntlet and throw back the new kids on the chopping block, so to speak. How does heir newest effort "Heretic" fare at this? Well, this record will have people buzzing, that's for sure, but if it's all positive remains to be seen. First, "Heretic" has flat-out the weirdest track layout I've ever encountered on a CD, making me wonder if the promo copy I got is what will actually appear on the store racks. Almost all the fast and heavy death metal material is front loaded into the first half of the disk, with the second half being taken up by various moody instrumentals, a drum solo and a final guitar solo. What the f@#$?! This is a very odd sequencing of songs if it represents the final product, but Morbid Angel is so unconventional that this might indeed be the way "Heretic" is presented. Now onto the material and it must be said that guitarist Trey Azagthoth proves once and for all he is the most distinctive and outrageous player in death metal. 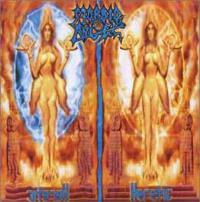 There are riffs and solos here that sound bizarre even by Morbid Angel's peculiar standards and on one track, "Beneath the Hollow", there's an amazing part where two separate guitar patterns are played independently but still merge to form one united whole. That, my friends, is sublime weirdness. Trey's takes a lot of bad mouthing from notoriously trendy death metal fans but in my humble opinion, he is the genre's equivalent of Jimi Hendrix. But as memorably weird as the guitar work here is, the production kind of lets it down with a very old school feel. Pete Sandoval is one of the most blisteringly fast drummers on the planet, but the drums on "Heretic" sounded so processed that it really hurts the material. It would be so much better to get a "live" drum sound than this synthetic cheese. "Heretic" will please faithful followers of the Morbid Ones as it sounds like a convincing cross between "Altars of Madness" and "Gateways to Annihilation". But if that nutty track listing remains, the record is one of the most anti-climactic ever released. This totally rips! Blasting out of the gate with a frantic thrashing pace, this reminds me of material from the very first classic Morbid Angel album "Altars of Madness". Pete Sandoval's drumming is merciless. Azagthoth does indulge in some of the slower, weird riffing he has become known for in the middle of the track. This cut is one of their best efforts in a long time. A cool growling mid-paced riff starts this off, mixed with a very twisted faster guitar run. It heads from there into a blistering blast beat number. It's completely punishing but the catchiest track on the disc. This track takes a slower approach, with a creeping feel to it. It contains the most bizarre and warped guitar playing I've heard from this band. There's a mid section where a different guitar pattern is coming from each speaker but the total effect is harmonious. There's an almost classical music feel to the arpeggios here but the cut is still bruising death metal. An ominous, spidery vibe permeates this tune, with Steve Tucker indulging in his most deathly vocals. There seems to be more attention to melody here but I'd call it one of the more average "heavy" cuts. This is a really choppy, staccato feeling track that jumps around nervously. Azagthoth's chunky guitar picking dominates this twisted and highly technical cut. Now this is death metal! Assaulting the listener with a blazing riff fest from the get-go, this has a got a great morbid, war-like feel to it. The vocals are raspier than the usual deep growling and I wonder if maybe Trey is singing on this cut instead of Steve. This is the sort of pure mayhem that made Morbid Angel the leaders in their field! Well, this cut introduces the much weirder second half of the CD with the first of many instrumentals. This is certainly the most unnerving. It's a LOUD collage of ominous sounds including screams and half-audible children's conversations over a completely gruesome horror movie riff. It's one of the band's moodiest and effective ambient pieces. This is an instrumental of a different kind, a much more soothing acoustic number with a mysterious aura to it. It's quite brief. This is a heavy number with a pretty avant-garde approach. The main riff kind of flutters and fluctuates but manages to have a war-like aspect to it. The speedier parts feel oppressively morbid and the track again showcases the peculiar, impossible to duplicate sound that Morbid Angel has trademarked. It's anything but predictable. Choppy, staccato riffing introduces this fast death metal track. Despite the heaviness, this has a bit of a generic feel to it, like many other tracks the band has done, though I do like that cool hook on the chorus. This is a mellow acoustic guitar interlude that lasts way too long and shouldn't even be on the record. It's pretty enough, I guess, but it really belongs on something by Ottmar Liebert. With all the other instrumentals here, this is the one that is most superfluous. Yup, you guessed it - another instrumental! Boy, the track layout here really freaks me out! This is more cinematic and symphonic than the previous track and at least has drumming on it. I could easily imagine this as a soundtrack to some Hollywood Roman or Egyptian epic. It's cool but it's impact would be so much greater if used as a lead-in to a heavy track, rather than just sitting with a bunch of other instrumentals. We hear producer Punchy asking "OK, Pete, let's hear your kick drum" and then drummer Sandoval blasts into a blistering blast beat attack of furious drumming. Pete really is one of the fastest, most adept drummers in death metal but I do wish it sounded a little less processed here. It's still quite impressive. Well, instead of ending with a real track or even an ambient outro, we get a guitar solo from Trey here. Now you know how highly I regard this man's guitar output and indeed, this solo is still good, but really any of his solos from standard tracks like "Stricken Arise" or "Cleansed by Pestilence" is better than this. It makes for a most anticlimactic ending to a strange album.